It’s hard to go wrong with any seats at PNC Park…you’re going to have a pretty sweet view in any direction wherever you sit. But some spots are better than others. I talk a bit about splurging on club seats here, but if you don’t plan to shell out extra cash, here’s a few more PNC Park seating tips. Well worth taking in the view even after the game. PNC Park Seating Tips, #1) Infield/Outfield Box. The lower level of seating at PNC isn’t too rough on the wallet as these seats go. The third base side might be preferable for the overall view (especially on fireworks nights), but you’ll be very happy with any seat that’s not in the corners. Outfield Box Sections 107 and 127 especially cost much less than seats just one section over, but if you can get Infield Box close to home plate, go for it. Infield Box seats are priced the same all the way out to just beyond the infield dirt, so it’s a good deal if you can swing it. Manny’s BBQ excepted, the lower level concourse has the best food choices at PNC Park, like the Primanti Bros. sandwich and the Abso-Bac’N-Lutely Burger…you can read about those here. 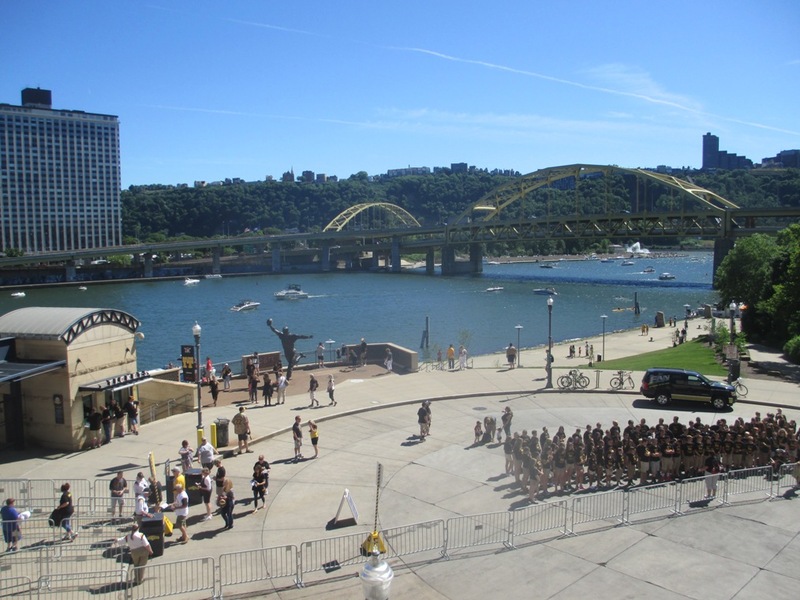 Watch boats go by on the Allegheny at no extra charge. 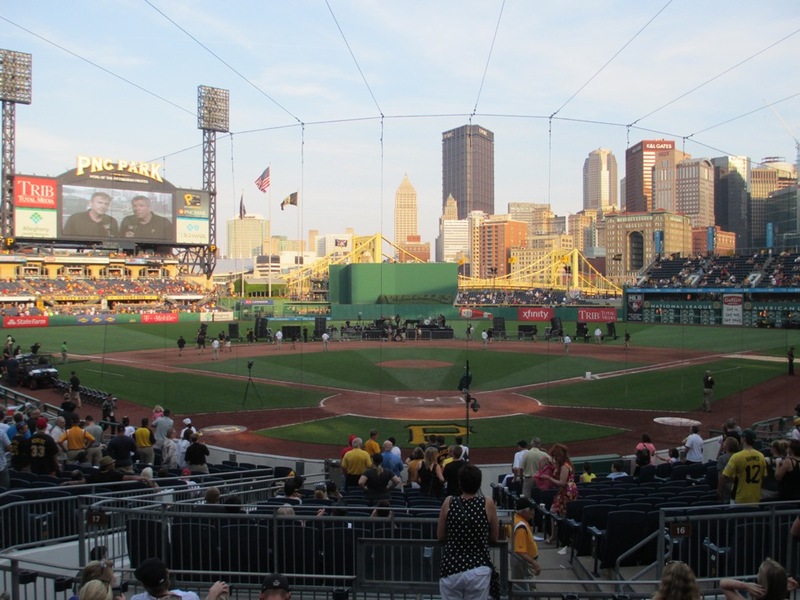 PNC Park Seating Tips, #2) Infield/Outfield Grandstand. The panoramic view from the upper level Grandstand is truly impressive…probably the best in baseball. There’s also some sweet views of the rivers and bridges from the right field concourse. But it’s pretty good for watching baseball, too. Upper level seats are closer to the field than in most ballparks, and they’re very affordable, including discounted tickets for kids as I write this. I wouldn’t get too far in the outfield though…like any ballpark, you can still be pretty far away from the action. One caveat: watch for obstructed views from glass landings. On the Pirates 3-D seating map, you can see which sections have landings (313, 315, etc.). It’s not terrible, but I’d avoid Rows H-K in those sections. Some Pirates fans come to see a ballgame, not a river view. 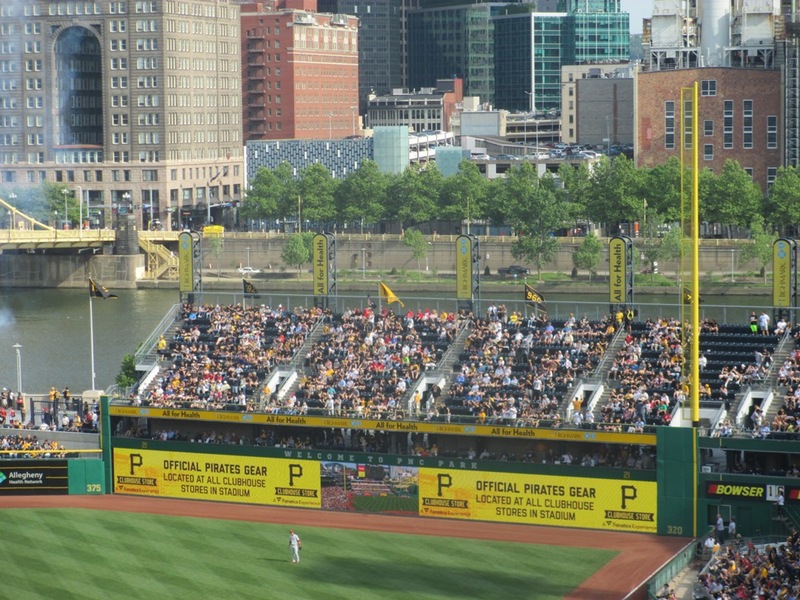 PNC Park Seating Tips, #3) Bleachers/Outfield Seats. Outfield Reserved seats in right field are cheap and have a fun atmosphere, but they doesn’t offer much in the way of a panoramic photo-op. It’s probably the only spot from which this ballpark’s view won’t wow you. The Bleachers in left field offer a better overall view and are closer, but unlike Outfield Reserved seats, they’re hard metal benches and can be uncomfortable. No shame in bringing a cushion. The bleachers are also in front of the big scoreboard, so you’d be missing out on pierogi races or whatever if that matters. One thing making the Bleachers preferable to Outfield Reserved is their proximity to the Jim Beam Left Field Lounge and the shaded Block House Corner under the rotunda, so it’s easy to grab a snack or craft brew and escape the elements. Millennials like that kind of stuff. On a hot sunny day you will definitely bake sitting in outfield seats; bring a hat and sunscreen. I speak from experience. 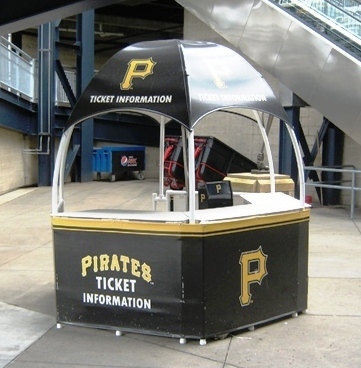 There’s three PNC Park seating tips for you…hopefully this helps whatever your budget and taste at your next Pirates game. If you’re planning a trip to PNC, be sure to get this absolutely free e-mail newsletter…it’ll tell you everything you need to know…and then some.